At the Bangkok end of the Memorial Bridge, stands the King Rama I Monument dedicated to the king who founded the Chakri dynasty and established the capital in Bangkok in 1782. 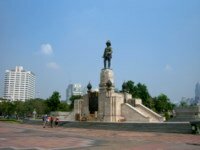 The King Rama I Monument was designed by Prince Naris; the statue was molded and cast by Corrado Feroci. The monument shows King Rama I seated on the throne placed on a high pedestal facing Bangkok with his back to the Memorial Bridge. Located in the middle of a traffic island, the monument is surrounded by busy roads leading to and from the bridge. Please see map to the monument. 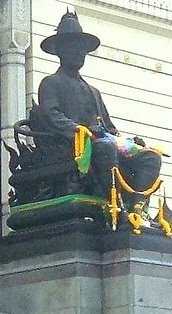 King Rama I (1782 – 1809) ascended the throne in 1782 and established the capital in Bangkok owing to space and security considerations and also to facilitate trade. 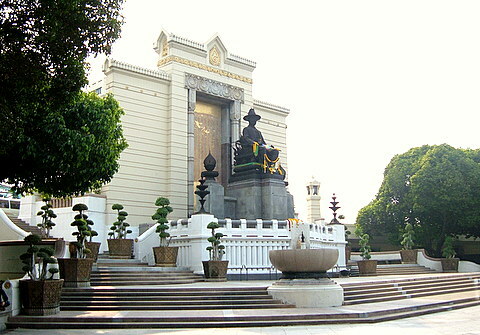 King Rama I named the capital Krungthep Mahanakorn Amon Rattanakosin. This marks the commencement of the Rattanakosin era with Bangkok as the capital of Thailand under the reign of the Chakri kings. To revive the glory of Ayutthaya, the new capital was literally rebuilt from the ruins of Ayutthaya, with boatloads of bricks and stone transported downriver from the old capital. The Lak Mueang (the city foundation post), the Grand Palace and the Temple of the Emerald Buddha in old Bangkok are some of the legacies from the reign of King Rama I. 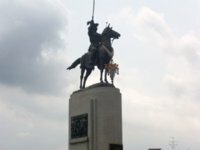 Early in his reign, in 1785, King Rama I defeated a massive Burmese invasion along the long Thai – Burmese border and the Burmese were never a serious threat after that. Thai suzerainty over the Malay states in the south was enforced to prevent further Burmese transgressions from the south. 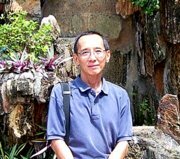 The reign of King Rama I had several significant developments. He disciplined the monkhood, established a system of government, enforced law and order and promoted trade. Literature flourished during his reign when he wrote the Ramakien based on the Hindu Ramayana epics in 1797. The Chinese classic Romance of the Three Kingdoms was also translated to Thai during this period. In 1932, during the reign of King Rama VII, the Memorial Bridge, the first bridge across the Chao Phraya was built, to mark the 150th anniversary of the Chakri dynasty. The King Rama I Monument was also completed at the same time to honour the founder of the Chakri dynasty. The monument located at the Memorial Bridge or Saphan Phut in the middle of an oval traffic roundabout with a tree-lined park. The Memorial Bridge is known in Thai as the Phra Buddha Yodfa Bridge, after the official posthumous title of King Rama I. However it’s commonly referred to as Saphan Phut. A quick way of getting to there is by the Chao Phraya river boat from Sathorn pier to the N6 Saphan Phut pier just below the monument. For the other monuments by Corrado Feroci.